Our March 2017 Basic Box focused on unique ink! 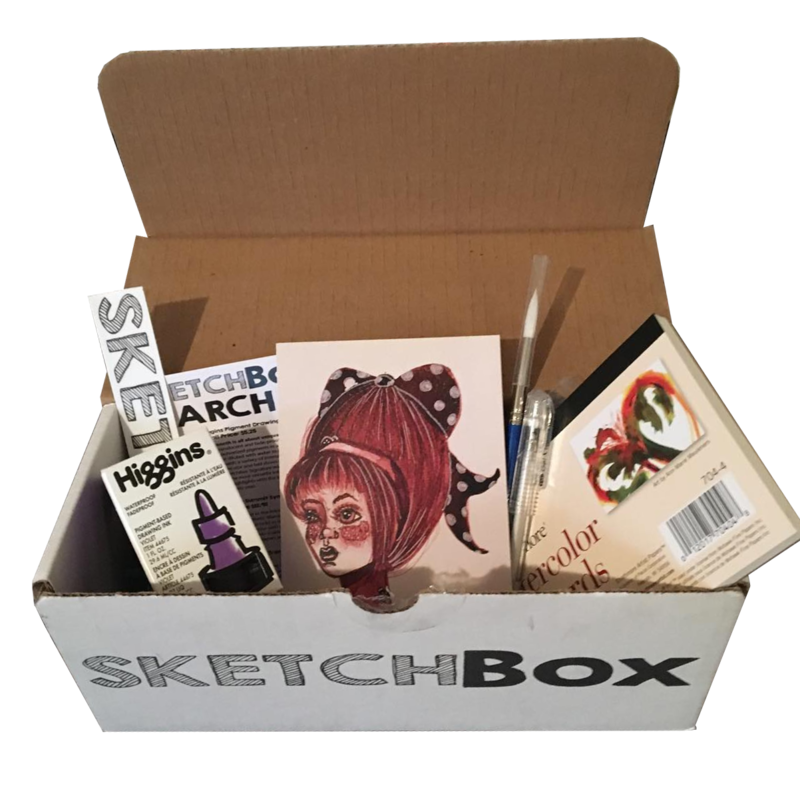 This box was curated to work well with both the January 2017 box and an upcoming one. It included Higgins Pigmented Drawing ink. Rich, translucent and fade-proof, this ink combines micro-pulverized pigments in a highly fluid formula. It can be diluted with water to produce transparent washes with a variety of intensity. It can be treated like watercolor and laid down with a brush, or loaded into a SketchBox Signature water brush. It truly is some of the most versatile ink available. Also included in this box is a Yasutomo Gel XTreme in white. Filled with a waterbased, non-toxic pigment gel ink that is high-quality and acid-free, the Gel Xtreme is an excellent choice for adding highlights over the higgins violet ink. We also included a Princeton Summit Round Synthetic brush in Size 8. New technology in the Princeton Summit brush line has created synthetic filaments that perform like natural hair. It can hold as much paint as natural fibers, and can release color with an even consistency. This brush is also durable making it perfect for working with rough watercolor papers and harder surfaces. Finally we included Strathmore watercolor postcards. Each elegant blank postcard is a 4" x 6" sheet of Strathmore 140 lb. cold-press watercolor paper. Made specifically to hold up to any wet media making it perfect to soak up the higgins ink. If you’ve been with us since January these are great for use with your metallic watercolors!